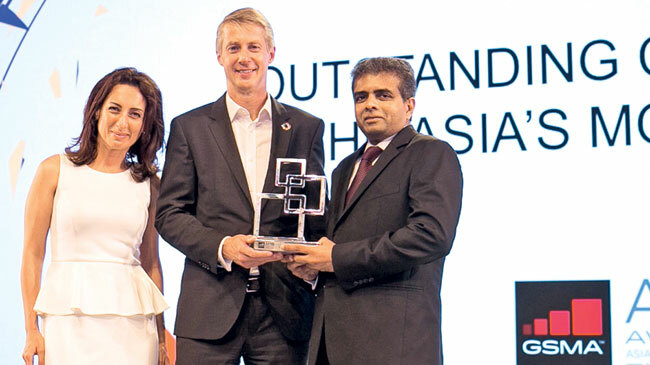 The GSMA, the worldwide association governing the Global Mobile Industry, has named ,Dialog Axiata Group CEO Dr Hans Wijayasuriya as the recipient of the ‘Outstanding Contribution to Asian Mobile Industry’Award for 2016. The Award as described by the GSMAis the highest honour at the Asia Mobile Awards 2016. The award recognises sustained and extraordinary contributions by individuals, organisations or collaborative achievements that advance the value and benefits of mobile communications for people, business and societies in Asia”. Dr Wijayasuriya received the award at the Asia Mobile Awards held in Shanghai China, becoming the very first recipient of the award which is being awarded for the first time this year. Dr Wijayasuriya dedicated the award and accompanying international recognition to the Dialog Team, the company’s over 10.5 million over Sri Lankan customers and key institutional stakeholders. “The Dialog Team has proven that Sri Lankan talent is second to none across the globe and together with our valued customers and partners, are principal contributors toward this recognition. Equally, we are indebted to the Government of Sri Lanka for the progressive policy environment espoused with respect to ICT advancement, and to the Axiata Group for its consistent and committed investment in Sri Lanka’s ICT infrastructure over the past two decades” he said. soon after receiving the award.